At the premiere of Elgar’s Cello Concerto in 1919, John Barbirolli – himself a cellist – was playing in the London Symphony Orchestra. When he recorded the work in 1965 he chose Jacqueline du Pré as soloist and she remains inextricably linked with this elegiac, but passionate work. 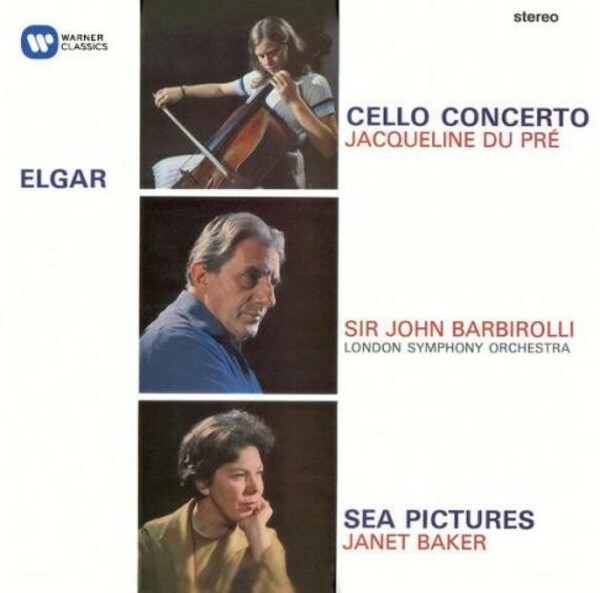 Barbirolli’s special affection for Elgar’s music is just as evident in the glorious account of Sea Pictures with Janet Baker, and the Philharmonia Orchestra's rendition of the Cockaigne Overture. Jacqueline du Pré was essentially a spontaneous artist. Her style is freely rhapsodic, but the result produced a very special kind of meditative feeling; in the very beautiful slow movement, brief and concentrated, her inner instensity converys a depth of espressivo rarely achieved by any cellist on record. Like du Pré, Baker is an artist who has the poewr to convey on record the vivdness of a live performance. With the help of Barbirolli she makes the cycle [Sea Pictures] far more convincing than it usually seems... On CD, the voice is caught with extra bloom, and the beauty of Elgar’s orchestration is enhanced by the subtle added definition.